July has begun, hopefully it will be a good month for all of you, dear web visitors. 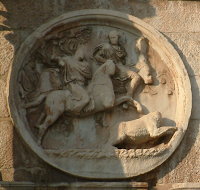 Today a little ancient horse story. 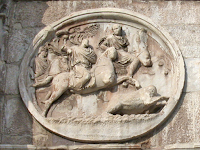 I introduced the story of the Sarmatian/Alan horses among the Romans during the ancient empire in this post. 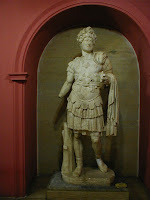 I also wrote there about the emperor Hadrian's mount Borysthenes Alanus. This hunter's name was preserved for posterity because a poem was written and it is thought that the poem had been composed by Hadrian himself. Lately I copied the poem in its Latin original that is thought to have been carved in stone as a part of a funerary monument set upon this horse's grave. hic situs est in agro. So, scholars believe that this avid hunter (even shown on his coins hunting from horseback), horseman and great Roman emperor had his spirited Borysthenes Alanus buried near or in a town called Colonia Apta Julia (Apt in France) in Gallia Narbonensis situated on the ancient Roman military road called Via Domita. Most likely the horse died during a boar hunt in Gaul. From Cassius Dio and Historia Augustae we know that Hadrian had several monuments erected to his pets, however, neither of the sources mentions this Borysthemes Alanus. 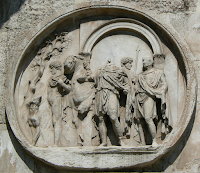 the roundels come the Arch of Constantine, and are thought to depict emperor Hadrian hunting.